This Christmas Eve was the second year the man and I celebrated with a special dinner for two. Last year I dropped a blade on my foot while doing dishes and have a “wonky” toe to commemorate our first Christmas Eve dinner. Regarding the menu, we decided to tackle a mutual cooking goal . . . preparing fresh lobster. 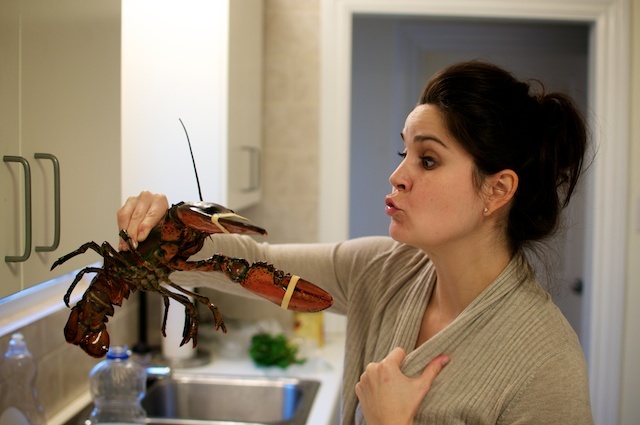 Truth be told, the entire lobster experience was a scene from Julie and Julia. I ran out of the room, with my 8-month-pregnant belly, while the man plunged them to their death. LOBSTERS TRY TO CRAWL OUT OF THE POT! It is scary. They push up on the lid. I couldn’t help but hide my head in my shirt while the man took care of the slaughter. We prayed a special prayer before we ate, and thanked God for his birth on Christmas, and the delicious sacrifice of the lobsters. There really is something powerful about eating food that you have seen alive. 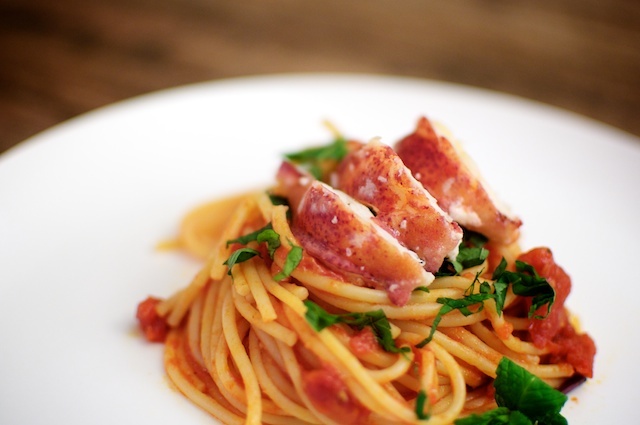 We prepared Lobster Diavolo, featured by Food52’s Merrill Stubbs. 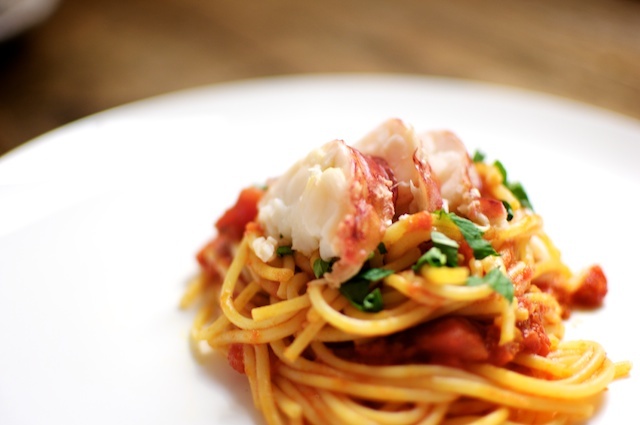 The creamy, sweet lobster sits on top of spicy pasta. The combination was incredible, but we did reserve a large portion of the lobster meat to simply enjoy with melted butter. Merry Christmas to me! Heat oil in large sauce pan, and add garlic. Sauté until softened and golden. Add half of the red pepper flakes ( you can always add more later) and sauté for another minute. Add the tomatoes and a healthy pinch of salt, and stir together. Taste and add more salt or red pepper based on your taste. Reduce heat to low and cover. Tomato sauce can simmer while you prepare the rest of the meal. Now it’s time for the lobsters. In a large stock pot, boil one inch water. 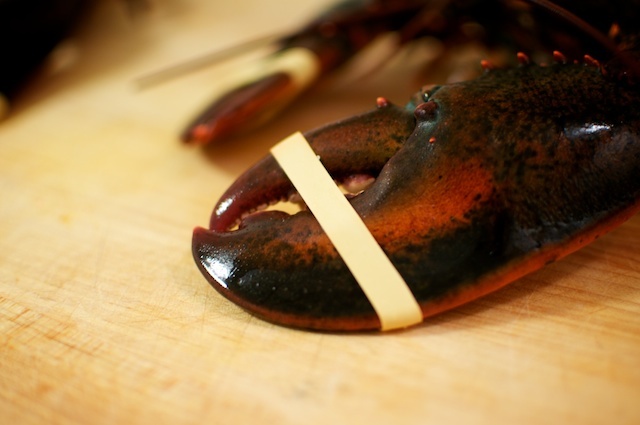 Place live lobsters in and immediate cover with lid (HOLD THE LID DOWN TIGHT). Cook lobster for 15 - 20 minutes. Remove and let cool. 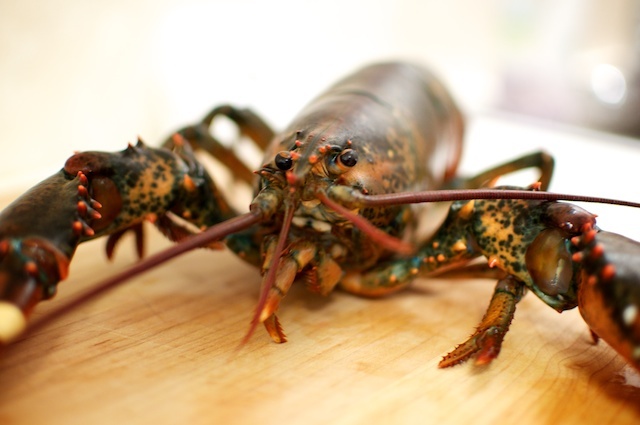 While lobster is cooking, boil a large pot of generously salted water (it should taste like the ocean.) 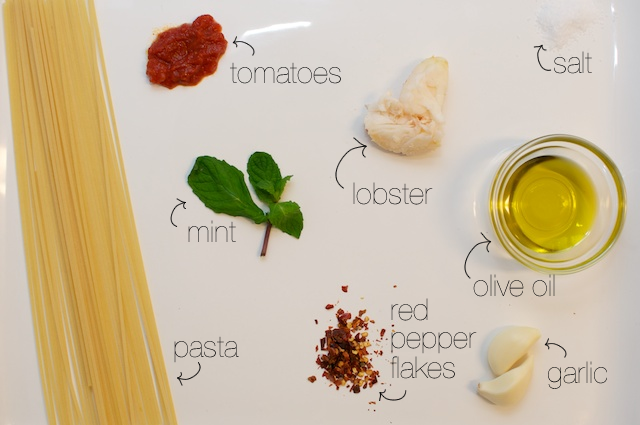 Cook spaghetti until al dente. Before draining, scoop out a cup of the salty/starchy pasta water and reserve for the sauce. Drain pasta and set aside. Meanwhile, turn the heat up under the tomato sauce to medium. Add the cooked pasta, with a little splash of the salty/starchy water to loosen it up, and use tongs to make sure all the pasta is coated with the tomato sauce. Feel free to steal a bite and add more salt or red pepper. Top with fresh mint and slices of lobster meat.